We visited a rarity in Bangladesh: an elderly care center, partly privately sponsored and mostly paid for by the families of the people that live there. There are six buildings with 20 residents, women with women and men with men. We portrayed four of their residents. This is Abdul Alim. 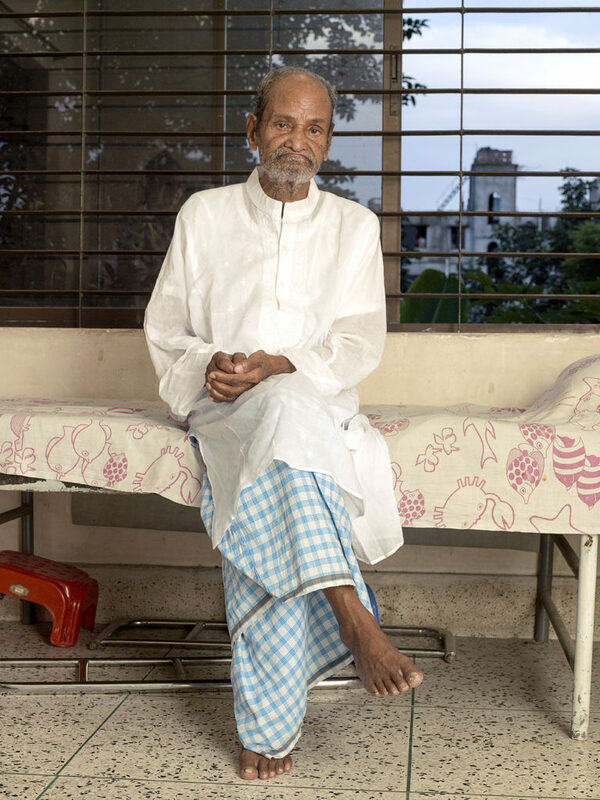 As told by Selina Akhter, founder of Subarta Trust Elderly home: Abdul Alim, suffering from “Parkinson’s disease” age around 95, Resided in Calcutta pre-partition of India and Pakistan(1947). Worked in (was part owner) of a famous printing company. And was responsible for gold embossing hard cover books. In 1947 amid religious tension between Indian Hindus and Muslims, a lot of gruesome murders were committed. During that time, Abdul Alim, was a young entrepreneur as was soon to be married but saw four decapitated heads in front of his door step. This event caused him to scream and the trauma caused this “disorder”. In 1971, a section of the Printers moved to engaged in brutal murders The printer company was stationed in Old Town. Has extended family in Dhaka, the property was seized by his extended family, he never married and had no children. He used to live in a dark basement beneath the printers. Another family member saw him in this state and decided to arrange for him to be moved to this center. Many of his relatives, although surviving and benefiting from Alim’s properties, don’t contact him nor do they support his care financially.